The Hosa straight headphone extension cable (1/4 in. to 1/4 in.) is designed to extend the reach of hard-wired headphones with a stereo 1/4" plug. 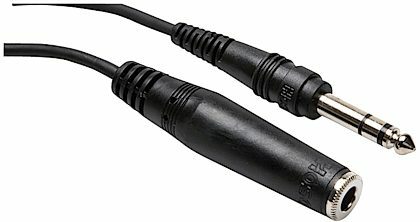 It may also be used as a stereo extension cable. "Save your money, buy a better cable." Sound: Sound is fine when it works. Ease of Use: Plug and play Quality: Horrible quality cable. I have gone through 2 of these in my home studio. I am very gentle on my cables, as i don't have the money to replace them often, this cable however, has managed to break very quickly with very little use. It seems to be a really bad end that is used at the female end, both times one side (left or right) goes intermittent, playing with the end can fix it sometimes, but eventually it will stop working completely and you have to replace the cable since the end is molded plastic and does not open for repairs. I wish zzounds would sell a different one, but i guess I'll have to look elsewhere. I will not buy another one of these. Value: Cheap, and it breaks often, so not worth it in my opinion. 61 of 72 people (84.72%) found this review helpful. Did you? Overall: This cable is the worst. After having it three days, the sound began cutting out randomly from the headphones. How would you like to be concentrating in the middle of an important take, and the sound just totally cuts out?